Hollow rotational shape parts, namely subterranean pipes, are produced using equipment which is a combination of spray-up and centrifugal casting. Spray equipment is moving along the central line in rotating mould – tube of given inner diameter and it distributes the mixture of chopped fibres, initiated resin and various fillers according to computer program. Laid material is gradually densified by means of centrifugal force developed by fast rotation of the mould. As a last inner layer (so called liner) there is applied high flexible resin or chemical resistant resin for majority of pipes for sewage waters and corrosion applications. Cured tubes is easy to take out of the mould thanks to shrinkage of composite. Resins: Common polyester resins orthophtalic type are used for basic layers, chemical resistant vinylester resins for corrosion applications and high flexible (up to elongation 50%) special resin as a liner for abrasive resistant tubes used for sewage water. 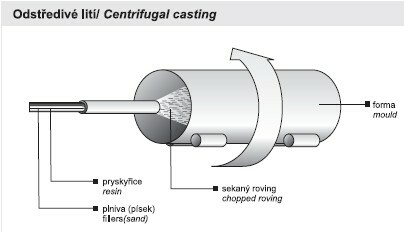 Centrifugal casting (Hobas process) is up to some extent the competitive technology for pipe production by filament winding, but it is optimal for thick-wall subterranean tubes. Standard products are 6 m sections in diameters within 250 – 1500 mm.